July 18, 2018 (Lincolnshire, Ill.) – The Electrical Distributor (tED) Magazine, the official publication of the National Association of Electrical Distributors (NAED), has named Klein Tools Co-President Tom Klein, Jr. to its 2018 "30 Under 35" list of rising stars. Representing today’s top emerging leaders in the electrical industry, the annual list recognizes 30 talented young professionals who have the initiative, drive, integrity and creativity to move the industry forward in the decades to come. As co-president of the sixth-generation family-owned company, Klein has accelerated Klein Tools’ innovation trajectory with the launch of game-changing new product lines. Under his leadership, the company has introduced a range of multi-use tools, illumination products, Work@Height safety solutions, specialty HVAC tools, battery-operated equipment and products designed to make “Life on the Job” better. Klein also played a vital role in the research, development and execution of these innovative lines to ensure the products meet customers’ needs, while keeping Klein Tools as the No. 1 choice among electricians and other tradespeople. 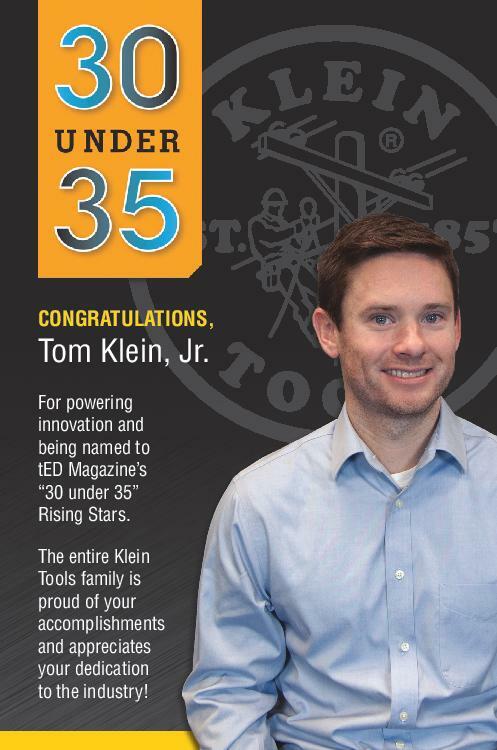 "Congratulations to Tom Jr. and the other honorees of tED Magazine’s “30 Under 35” list," says Klein Tools Co-President Mark Klein. "Tom Jr. has played a significant role in developing new sales channels, creating increased market share and contributing to our overall goals and objectives for domestic growth. His leadership within our company has allowed us to provide the latest innovations and premium-quality tools to the hardworking people using them in the field. I couldn’t think of anyone more deserving for this award." tED Magazine's competition, which is open to electrical professionals 34 years old or younger at the time of nomination, drew nominations from mentors, managers and other industry leaders working in electrical distribution, manufacturing, and related technology and service organizations. The tED Magazine editorial team blindly judged each submission, placing emphasis on such traits as dedication, innovation, leadership and people skills, commitment to training, personal integrity and work-life balance. This year’s winners will receive their awards at a special ceremony at the NAED Leadership Enhancement and Development (LEAD) Conference in Austin, Texas on July 18-20, 2018. For more information on Klein Tools, please visit www.kleintools.com. Klein is a registered trademark of Klein Tools, Inc. Since 1857, Klein Tools, a family-owned and operated company, has been designing, developing and manufacturing premium-quality, professional-grade hand tools. The majority of Klein tools are manufactured in plants throughout the United States and are the No. 1 choice among professional electricians and other tradespeople. For more information, visit www.kleintools.com.